The washing machine has been tirelessly churning loads of sun kissed, sweat drenched, dirt smeared, windblown, suitcase smashed clothes all day long. 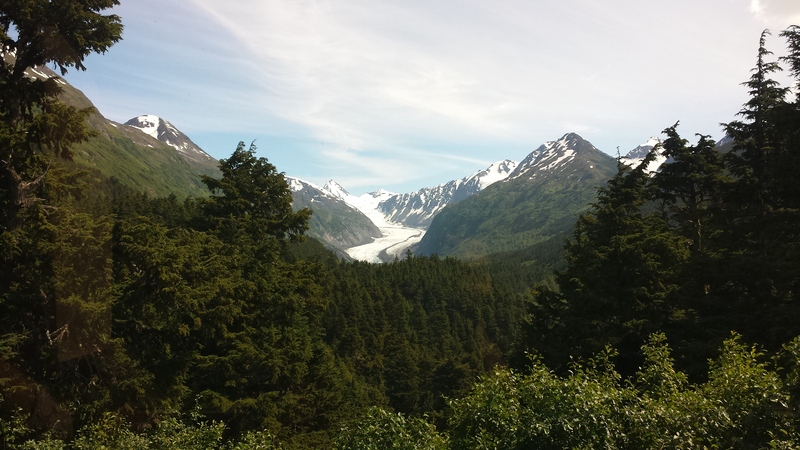 My husband, the kids and I just got back home after ten days of traveling through Anchorage, the Alaskan Inside Passage, Vancouver, and Washington state. In many ways, it really was a wonderful family trip. And it was such an amazing blessing to share these memories with so much of our extended family … my in-laws, uncles, aunts, cousins, and family friends. But sadly, amidst all of this, it has also been one of the most heart-wrenching trips we have ever taken as a family. Bittersweet is the word that comes to mind. Very bitter. Yet very sweet. A trip full of smiles and laughter and many tears. I’ll write about this later. For now … where do I begin? Well, our trip started with a 5 1/2 hour flight into Anchorage, Alaska where we landed at 1 am in a surprisingly bustling airport — the sky still lit with lingering daylight. We were all a bit of a mess after that flight. I finally fell asleep a little after 3 am. 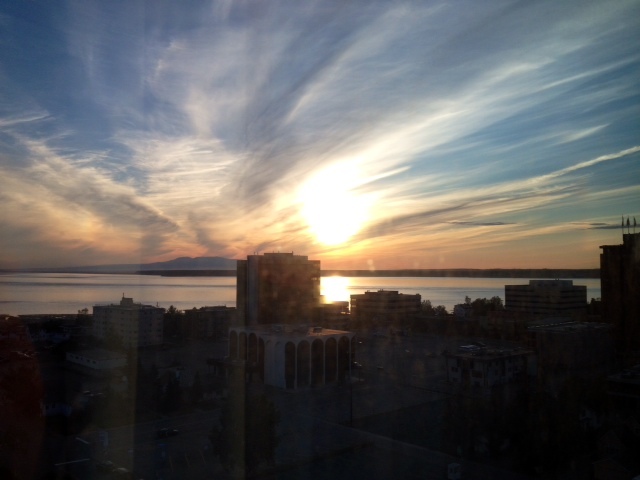 But here’s a view of a summer sunset from our room at the Marriot Hotel (photo courtesy of my mother-in-law). Truly beautiful. Our cab driver told us that in the summer, it doesn’t get dark in Anchorage until 1:30 am at times … and the sun rises as early as 3:30 am some mornings …. talk about a long day! The next morning, I woke up feeling surprisingly fine — okay, decent. 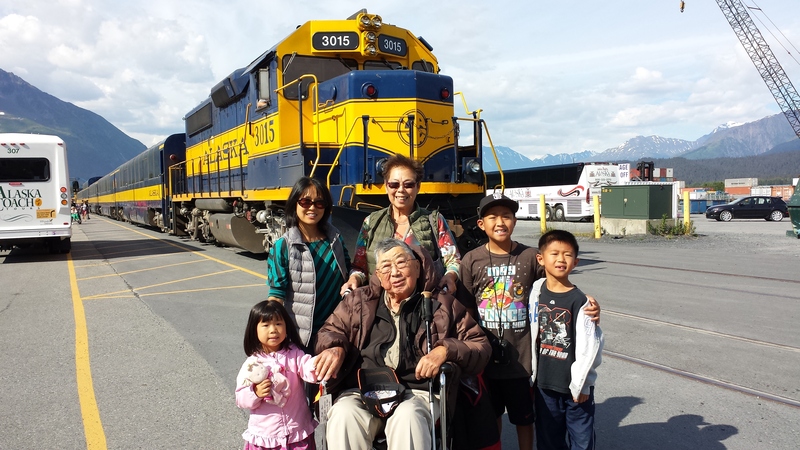 Later that day, my husband, kids, in-laws and I clamored into a window-canopied train for a five hour ride along the Kenai mountain range, multiple stunning glaciers, forests, and glassy lakes. As the train rolled along, the weight of God’s grace was overwhelming. 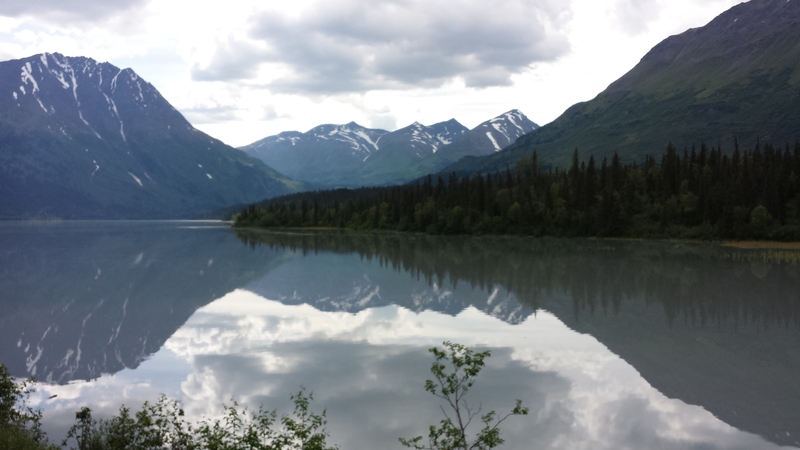 I was so thankful to be traversing through Alaska with my family, chomping on my berry infused beef jerky and indulging in a bowl of salmon chowder. The moments on this train felt refreshingly slow and sacred. Just a year ago, I was hardly able to step out of my home without collapsing. And now this was outside my window. We made it to Seward in time to board the ship to join the rest of the family and friends — ready to embark on our Alaskan adventure. So deeply thankful for these beautiful memories. To be continued…. please read part two for more of the story. Seriously so beautiful, Kim. So glad your family was able to take this trip together.